I’ll admit, I wasn’t too excited for this week’s Twilight Concert. I didn’t know many of the acts, and the rest of my colleagues and I had been racing across military level obstacle courses since 7 am that morning (a compelling story for another time). However, this concert turned out to be one of my favorite Twilight experiences so far. The first act was a girl named Belle Jewel. The first thing I noticed was her striking resemblance to the indie-pop singer, Bishop Briggs. Belle sported circular glasses, space buns, and white overalls over a black shirt. The set was pretty simple; vocals and an acoustic guitar or keyboard, but her voice was extremely relaxing and beautiful. 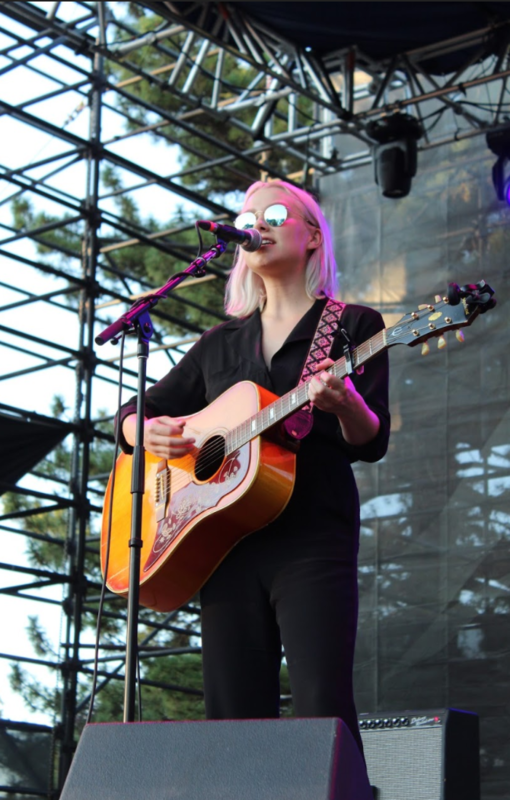 Up next was Phoebe Bridgers, a female indie-folk singer from California. 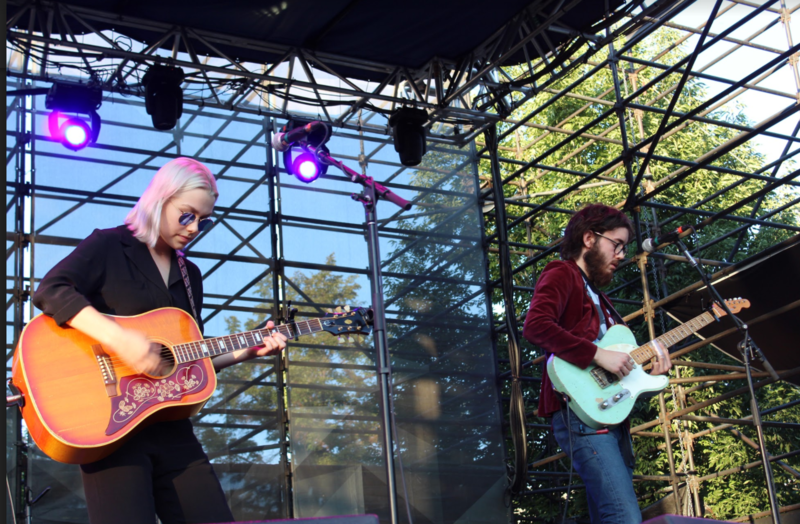 Her set was nice, and like Belle Jewel, the songs were relaxed and helped to set the tone for Cat Power. 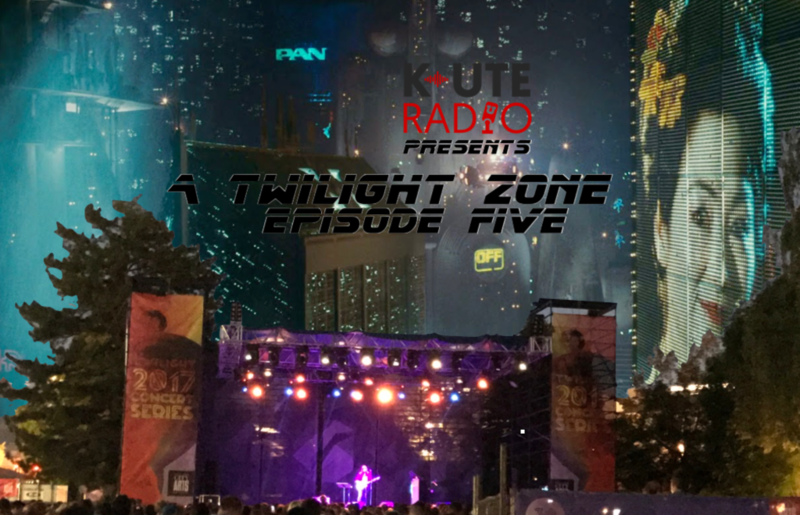 However, I noticed thatthis Twilight concert had a much different feel compared to the previous show where Solange headlined. All of the acts had a maximum of 2 people on stage, and the songs seemed to be more focused lyrically compared to instrumentally. While it certainly wasn’t the concert to go crazy at, it was a nice change of pace for the Twilight concerts and provided a calm atmosphere to sit down and listen to some good music. Finally, Cat Power took the stage to play a solo set with her piano and guitar. My friend and lovely DJ here at K-UTE, Tristan, and I sat down to talk and enjoy the show. We both immediately fell in love with her voice. It was heartfelt, vulnerable, and powerful all at the same time. 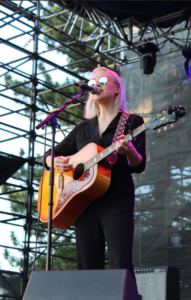 Occasionally she would stop to apologize to the crowd for a technical difficulty or if she thought her vocals sounded off, but the crowd wasn’t having it. They applauded and begged her to keep going regardless of any mishaps because she sounded beautiful either way. And suddenly, it was another Thursday night speeding across the city to one of the most unexpected Twilight concerts. Cat Power‘s appearance was being touted as “(solo)” for weeks now and it piqued the interest of more than a few concert goers beforehand as to how Charlyn Marie Marshall (aka Cat Power) would fare filling up the usual park. It wasn’t so much a question of audible loudness, but the energy that came from the previous acts. I arrived more than a few minutes late, missing out on Utah native Belle Jewel although hearing that she performed a nice acoust ic set minutes before my estimated time of arrival. Apologies to her performance. I meandered inconspicuously, wondering about the previous few Thursdays, how they began becoming this culmination of the week’s events. It was also taco night in the sponsor tent, and again, lanyards grant immeasurable access. Events seemed fleeting, the sun set earlier than usual, and I readied myself for the processing of thought whilst watching a performing act. 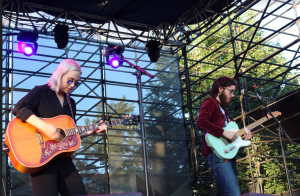 Minutes after this awfully meta cognition covering some tired questions, Phoebe Bridgers came out onstage accompanied by her self-named friend from Los Angeles (he had recently moved). 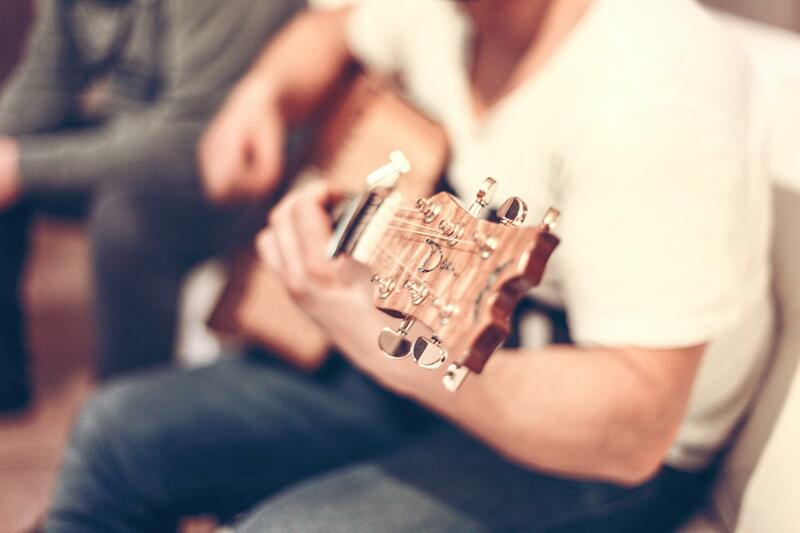 Phoe be was predominantly playing an acoustic while her newly-planted LA friend played electric guitar. 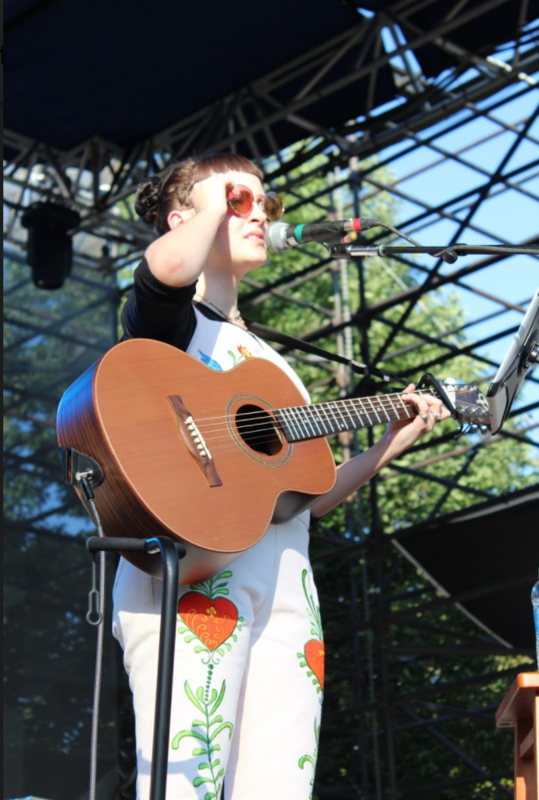 It gave her a fuller sound than the regular acoustic pieces the crowd had heard with Belle Jewel. The songs were a genuinely nice fit for the rest of the evening. Only because the music was quieter, in this sense of instrumentation, the set does not disregard the level of affection from the crowd. Belle Jewel’s set went through endearingly nice banter with the crowd and this created a sense of intimacy that went beyond the usual venue accommodations for the distance between performer and audience. While many of the songs had a similar appeal, the performance managed to help set the mood for the headliner. It was also her birthday, but that could have been self-proclaimed hearsay. Cat Power came out quietly under the purple lights and immediately began playing. 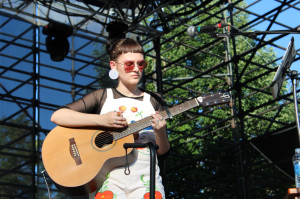 Her soulful voice carried around the park, now late-night summer dark, creating a new Twilight Concert atmosphere. It was quiet, and it was less rushed than previous concerts. Cat Power played song after song, without the need or apparent want to elicit cheers from the crowd with banter or anecdotes. The whole solo aspect was immediately apparent, but Cat Power held the attention of onlookers by her talent for guitar playing and lyrics. Not necessarily lethargic but inherently laid back was the theme of the night. A break from the heat and rushing crowd of past weeks. I found myself walking out of the park, greeted by night and noise awash the background voice of this singer.